Tomorrow begins one of the busiest months of the year…May! As a parent of school-aged kids, I always feel like there is so much to do and attend during this final month of school…choir concerts, field trips, end-of-year assemblies and programs. It can be a bit overwhelming! It wasn’t that long ago (well, maybe it was…I haven’t taught in over 19 years) that I experienced the month of May from the other perspective…the teacher side. I remember there being so much to do, as I prepared to move my sweet second graders onto third grade. So I guess it’s safe to say that both as a parent and a teacher, the month of May goes by quickly as we say farewell to another school year. It is during the month of May that we celebrate Teacher Appreciation Day. 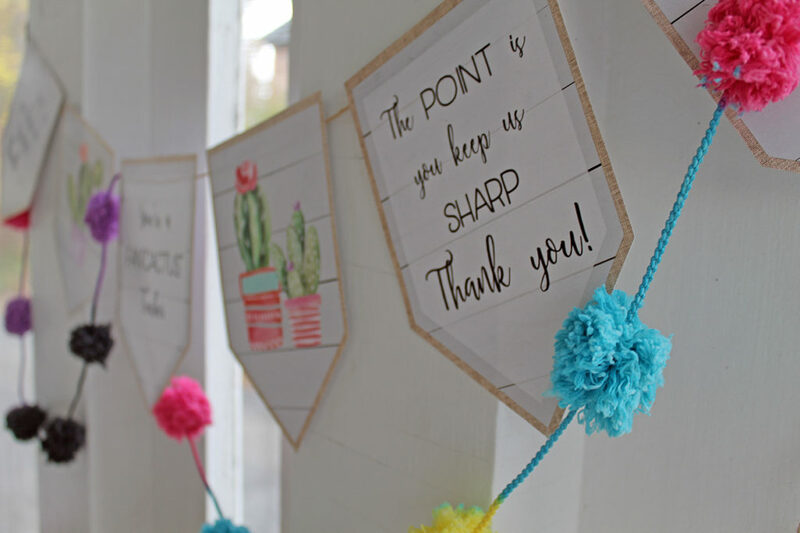 I know many parent organizations host breakfasts or luncheons for their teachers as a way of saying thanks for all they do…some even gift their teachers with a small token of thanks. 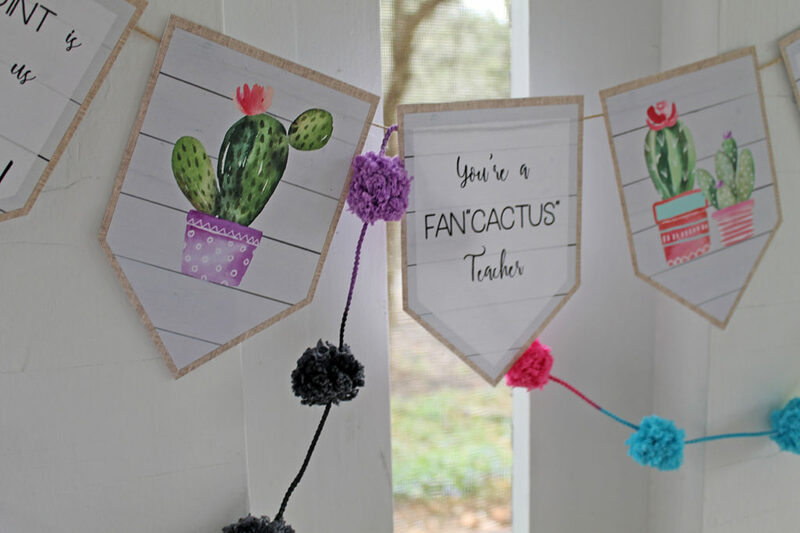 I love this day of showing my daughters’ teachers how much I appreciate the way they nurtured and taught them throughout the year…that is why I was so excited to team up with my friend, Christina, from Sunshine Tulip Design to show you some fun ways to incorporate her adorable FanCACTUS Teacher Appreciation printables into your own celebration! 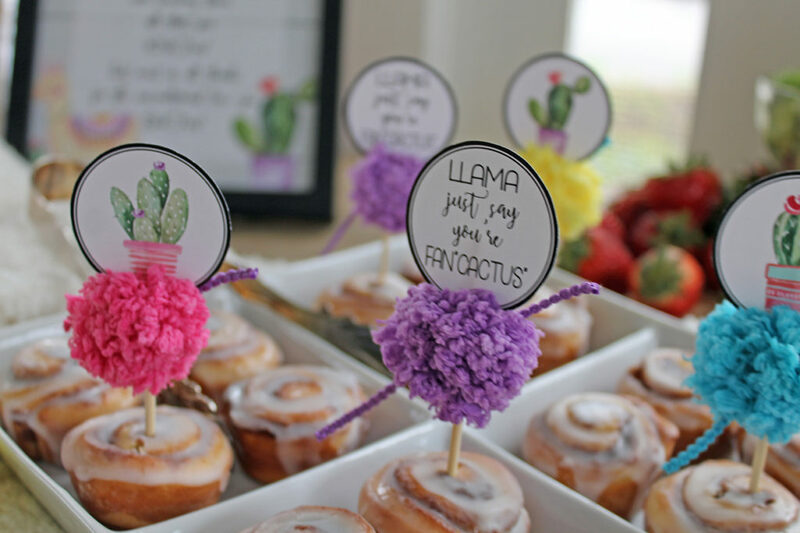 Okay, first of all how cute is this theme…I mean cactus AND llamas! 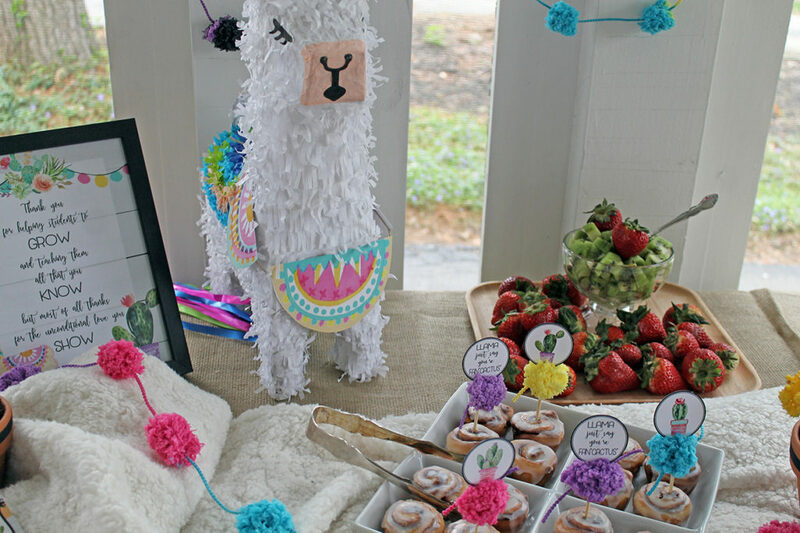 Two very fun trends right now and she put them together to create one fun party idea! The sign is so adorable and colorful. I just popped it in a black wood frame so the colors would pop even more. 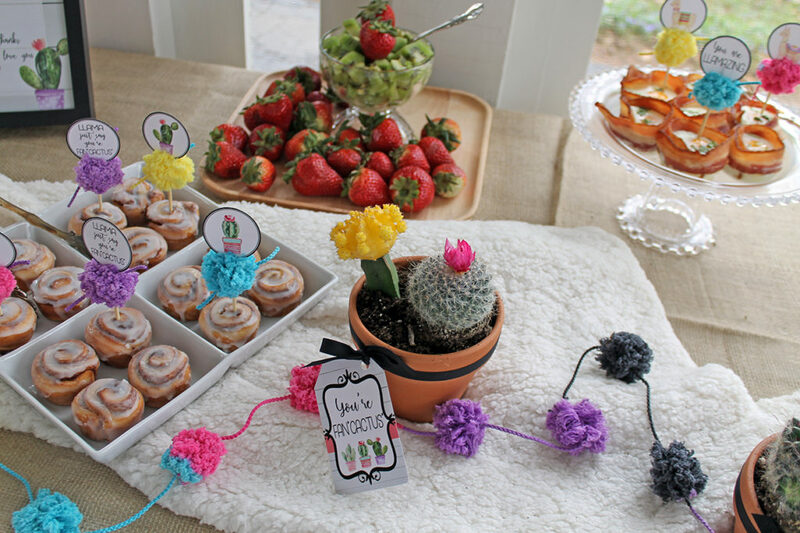 I think my favorite part of it is the pompom garland design at the top. 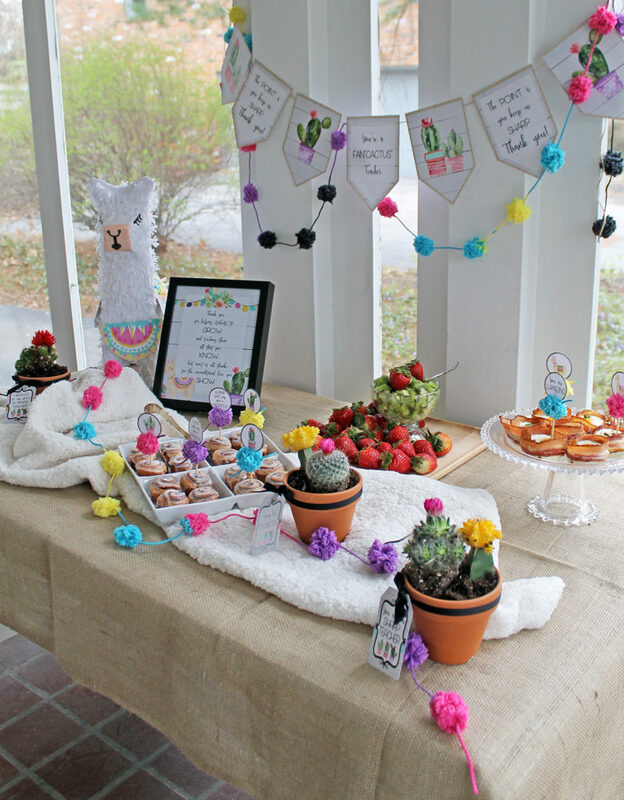 I had those colors and that design in mind when I find the perfect coordinating decor…multi-colored pompom yarn garland. I cut off sections of it and draped it across the table, as well as hanging it with the banner above the table. 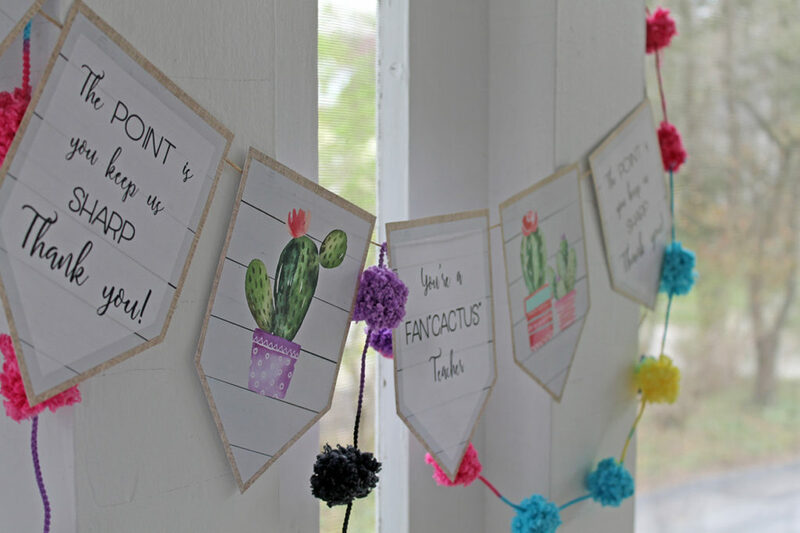 Speaking of the banner…I love the shiplap design on this banner, as well as the fun cactus design AND the play on words! 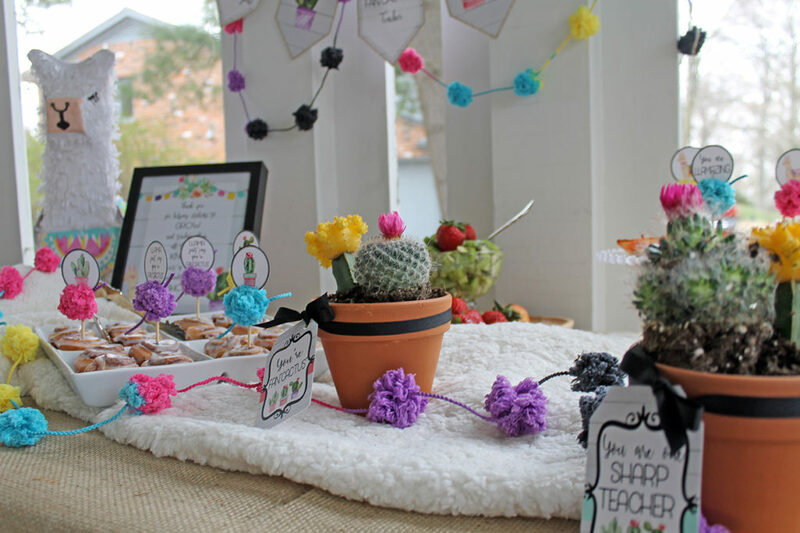 I also adore how the pieces of the banner are bordered with a burlap design…that was the reason for using burlap fabric as the tablecloth. I layered the burlap with some white faux fur fabric, mimicking the fur of a llama. 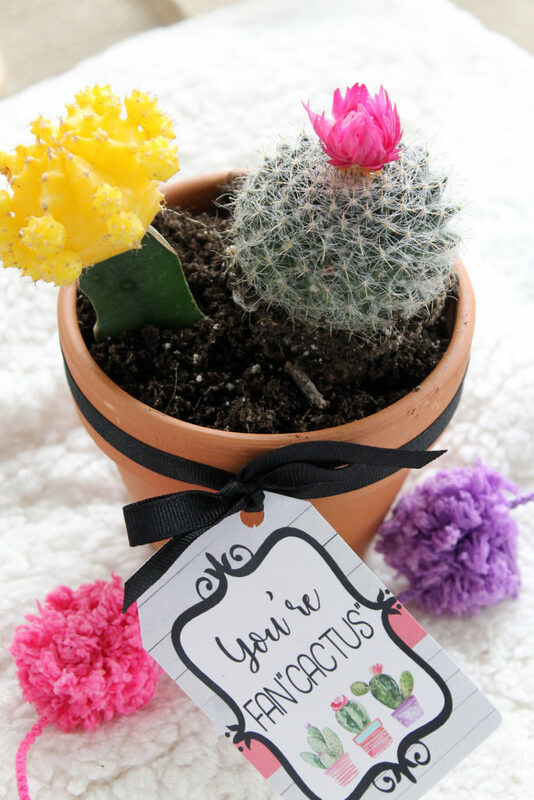 Of course I had to have some real cacti on the table! 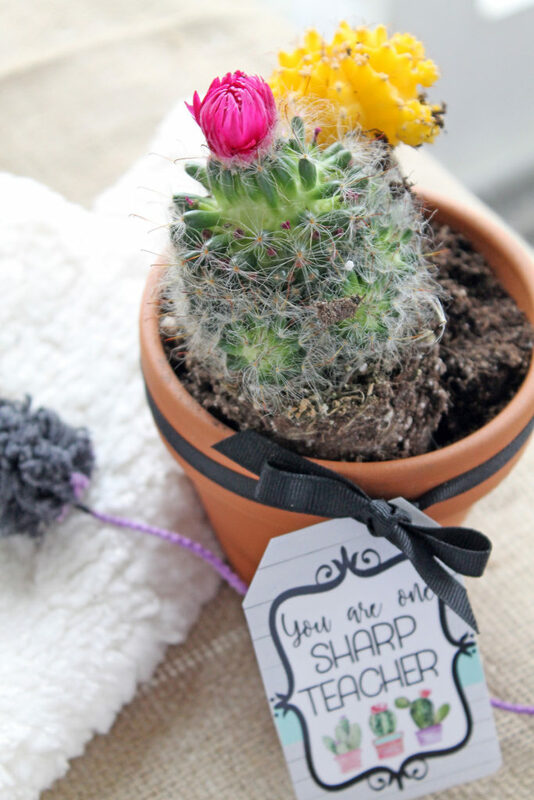 I placed them in simple terra cotta pots and tied some of the adorable printable tags around the top rim of the pot with black ribbon. 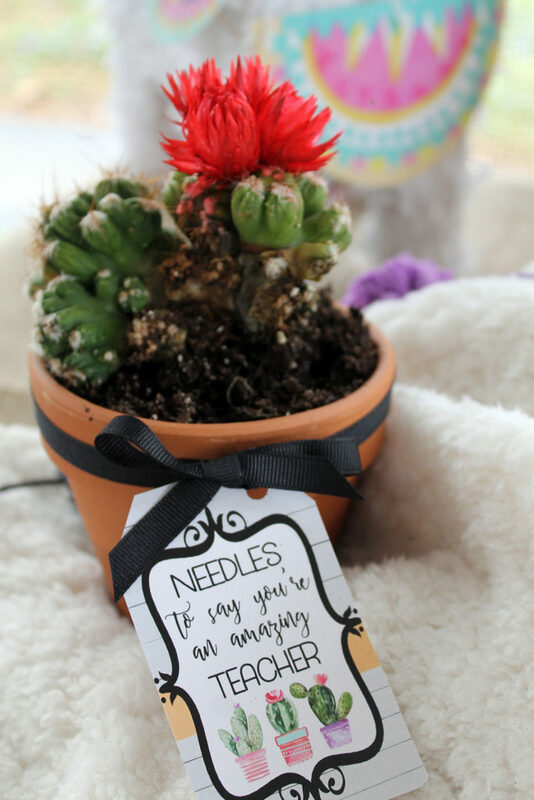 These could be used as centerpieces or take away gifts for the teachers. 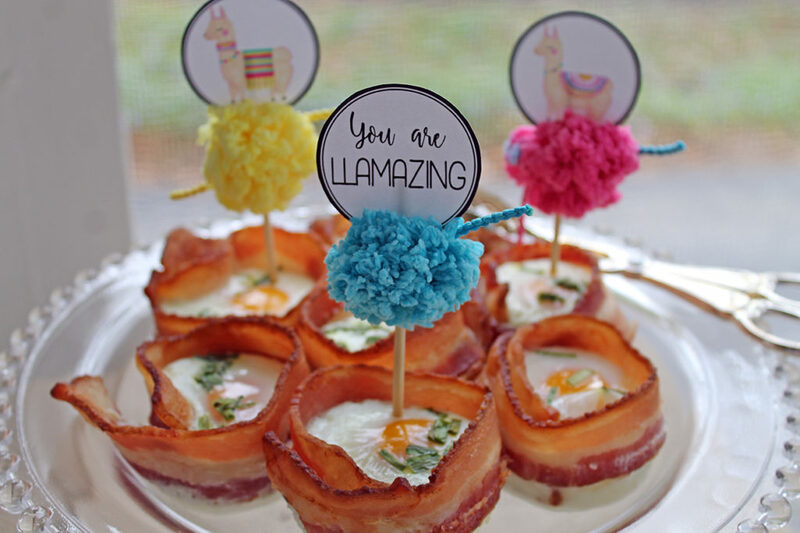 Now for the food…keep it simple with baked egg and bacon cups, mini cinnamon rolls, and fruit. 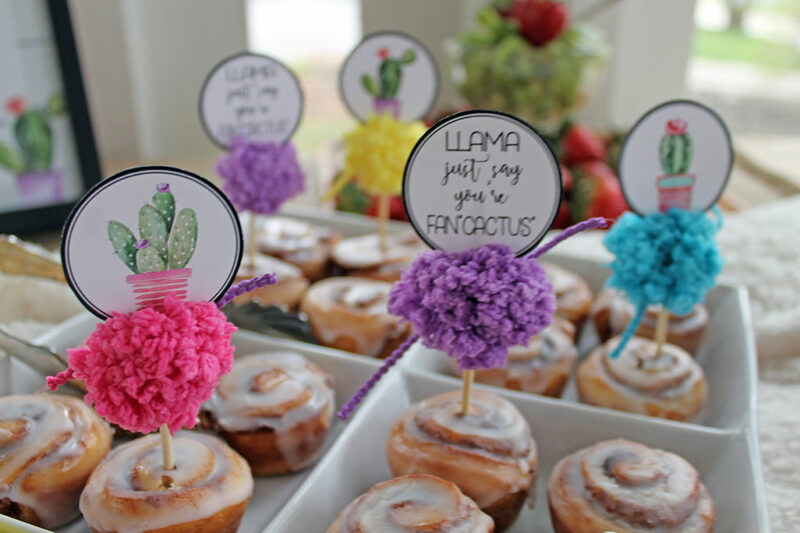 And I had some more fun with the printable food toppers. 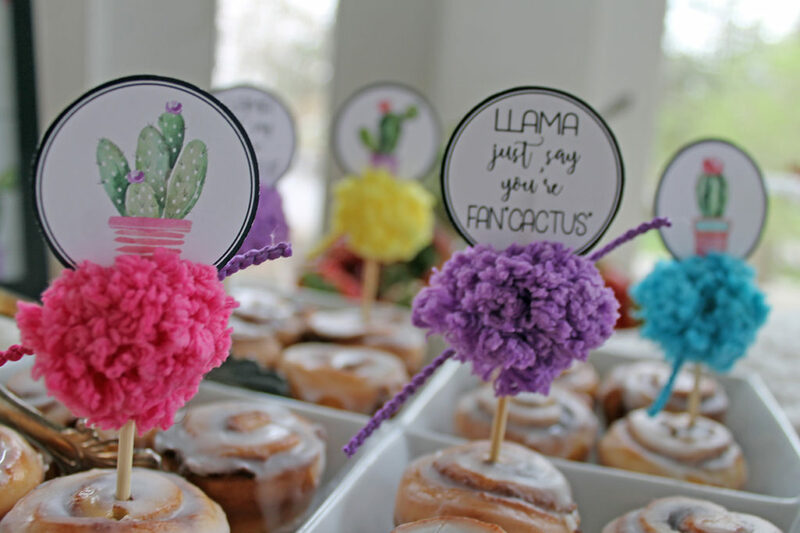 I cut them and attached them to short wooden skewers…and for an extra pop of color, I tied some of the individual pompoms around the stick. 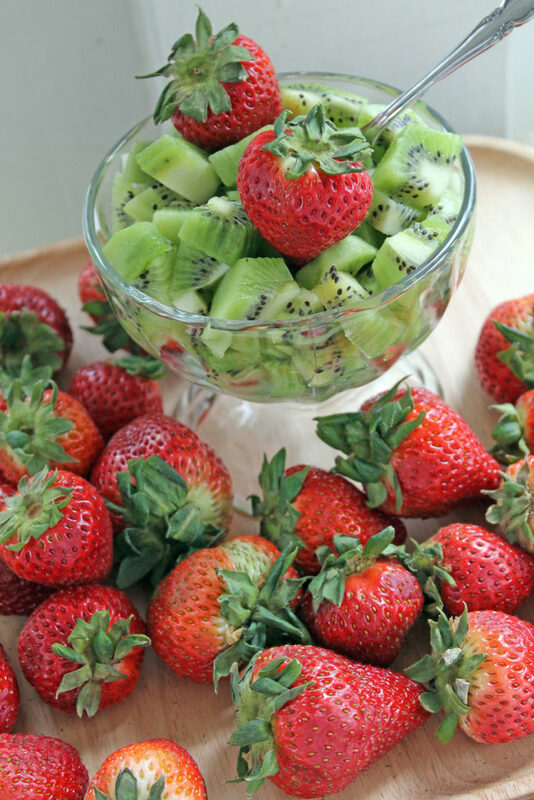 Then I just popped them in some of the food servings. 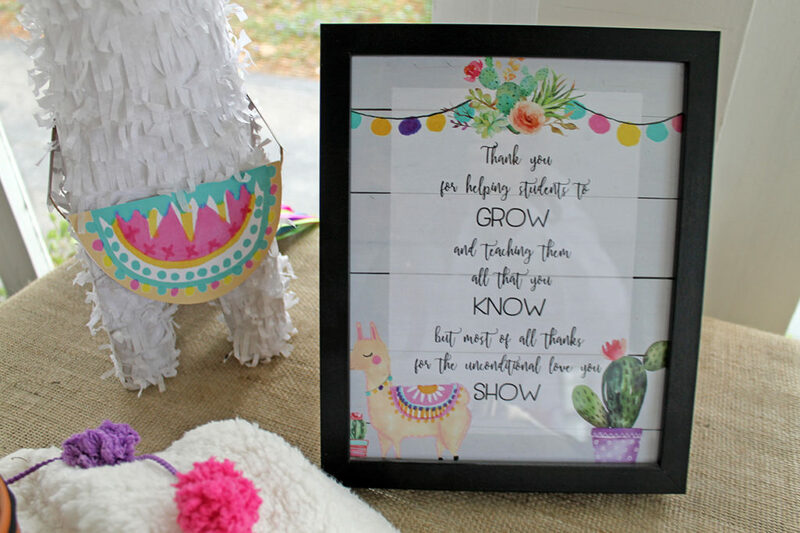 “Llama” just say that any teacher would feel “fancactus” by this show of appreciation…I hope I’ve inspired you to treat the teachers in your life!